The house we bought is across the street from the McDaniel Slough. The houses across the street have the slough in their backyard. We like the idea of the slough and the restored wetlands and are really glad that these public lands are being used so wisely. I have to admit we're also glad that the slough is not in our backyard. It's not so much the threat of rising tides, but the wildlife that these beautiful places attract. We were hoping to have fewer encounters with wildlife in our new house than we did in places like Port Townsend and Grass Valley. Yes, we absolutely love seeing bobcats and coyotes, raccoons and skunks, but we also love giving them the space they need to flourish and thrive. We humans have taken up so much of their habitat, it makes it harder and harder for our paths not to cross. So, it was a bit of a surprise to have two raccoons and a skunk come into our yard Thursday night. There was quite a bit of snarling and screeching, and it only ended after the skunk sprayed. Luckily, it must have been a young skunk because the unbelievably horrible smell had dissipated by morning. But here we are again rubbing shoulders with wild critters. We've been seeing lots of Cedar Waxwings in our yard, and even a Cooper's Hawk perched in the Cypress that's just outside the fence out back. There are lots of Barn Swallows swooping and diving everywhere and building nests under the eaves at our neighbor's house. A Peregrine Falcon did two flybys for us, and the vultures fly so close we could probably give them names and recognize them individually by sight (hah, just kidding!). 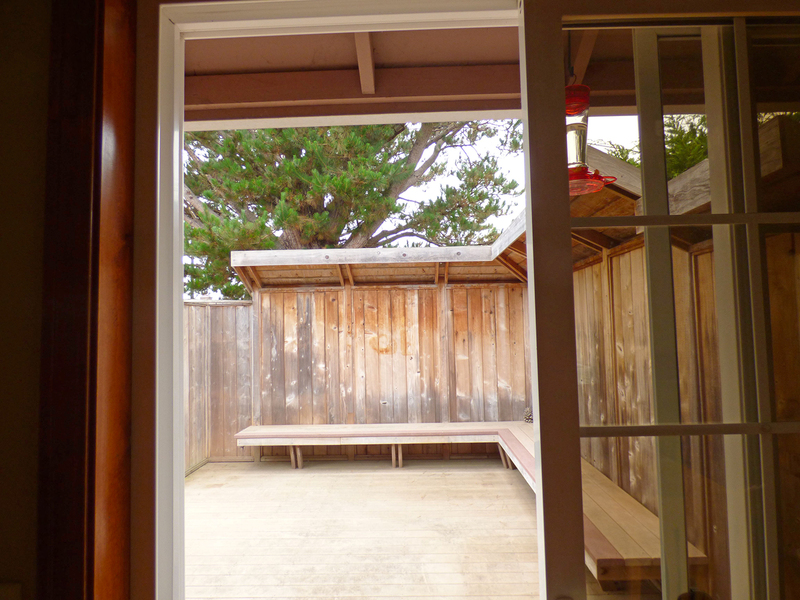 Interestingly one of the best, most wonderful surprises of the new house is the stunning view looking east. 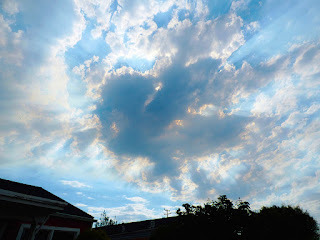 We have so much sky to look at, it is simply the best gift of all. When that fog is gone, we can see for miles and there is always something wonderful to catch our eyes, like this first full moon view. This is our 1500th post. Quite a milestone for us to have kept with the blog for so long over all these years. I'm pretty sure that there were a few earlier posts pre-2005 that somehow got lost during some blogger transition. I remember posting something on election day in 2004, hoping that George W wouldn't be re-elected. Ah well, we all know how that turned out. We've been settling in at the new house and enjoying it very much. We're looking forward to the window replacements, which is supposed to happen next Tuesday. We'll take before and after photos to share here, so you can see the difference. It was intensely foggy the first several days we were here, so staying inside and putting stuff away was an easy task without too much distractions of sunlight and blue sky and clouds. But all that changed on Wednesday and Thursday. 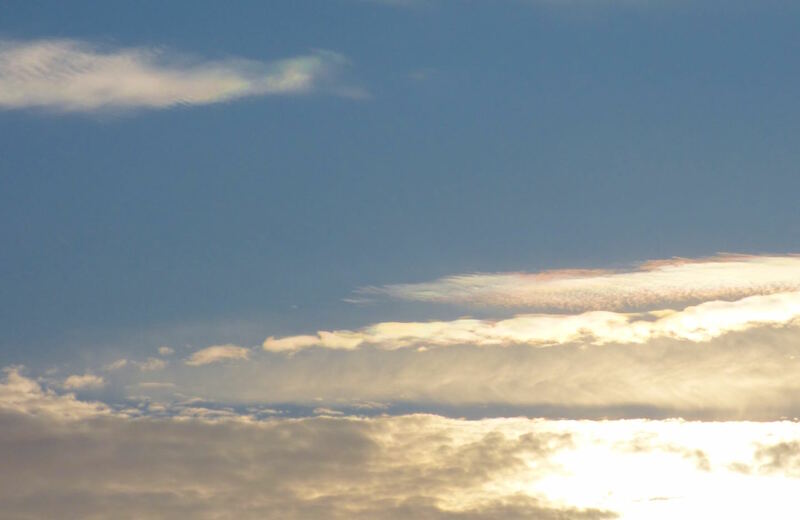 Beautiful skies in every direction. We could hardly stay inside, so we didn't! We did get out to the marsh about an hour before sunset Wednesday evening. It was lovely out there, but still no dabbling or diving ducks. We're hoping something tragic isn't unfolding before our eyes, but the dearth of birds is quite unsettling. I made a short video clip of this heron hunting. We loved the light rippling on the dry grasses and on the Great Blue Heron's body. Sure is great to have this sunlight. We appreciated every minute of it. I tried to embed the video but the address youtube provided did not work, no matter how many times I copied and pasted it. It's just a 14 second video, if you're interested. One last bit of news, the previous owners of the house left a hummingbird feeder hanging by the dining room sliding door. I just couldn't bear to let it go empty and have hungry hummers looking in at us while we were feasting on our meals. So, I'm feeding hummingbirds again, after more than a year of no bird feeding. At least we know that there won't be any bears coming to knock it down here. At least, we hope not! PS: Much gratitude to Loren for emailing me to let me know I had inadvertently called this heron an egret. Getting old is so much fun! Yikes. All of our earthly possessions have been moved into the new house. We have a two-car garage and more than half that space is taken up with Roger's tools and the boxes and boxes of stuff we never unpacked for the year we were in the rental. We've learned how to live without all of it. I even fantasized about not missing any of it. But, when we unpacked our art, our hearts soared and our eyes filled with tears. All the beauty we had not seen for so long. I had even forgotten about some of the pictures we hang on our walls. Seeing the photo of the Himalayas taken by a friend of Roger's in the 1970s took my breath away. 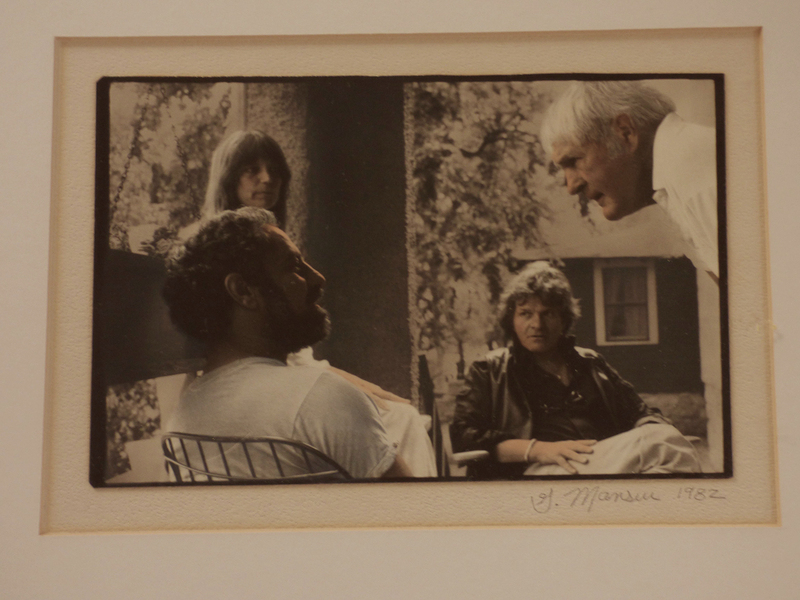 This photo of Abbie Hoffman and Johanna Lawrenson, Timothy Leary, and Gregory Corso is a favorite of mine from 1982. My ex-husband took this at the Kerouac Conference. I couldn't believe I had forgotten it, but I had. 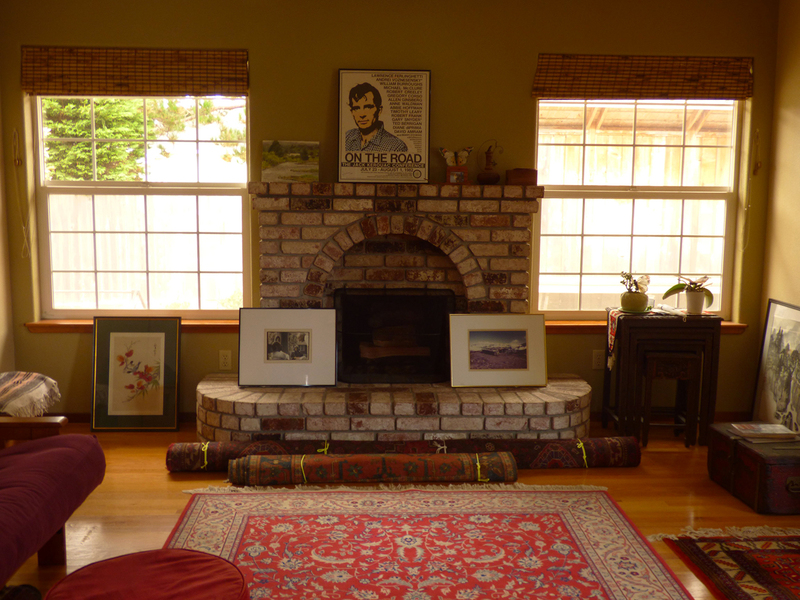 We placed all of the art all around the house just to remember and dream about where to hang it. It is like waking from a deep sleep, seeing all this again. Ah, we begin to become ourselves surrounded by the the pieces of life we have collected over the years. We have moved from the ascetic life to the aesthetic life. We are getting to know this house after only two days here. Our first major realization is that we're going to replace every window that faces west, which is almost all of them. The previous owners preferred a sallow, bronze-tinted window for privacy. I find it utterly insane. I am a natural light window gazer, as you all know. This lighting is ridiculous. It cuts whatever available light is out there, which isn't much in this foggy northern clime. 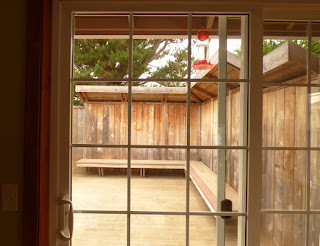 When I open the sliding door to the deck, I see what the real light outside looks like. I do this often. 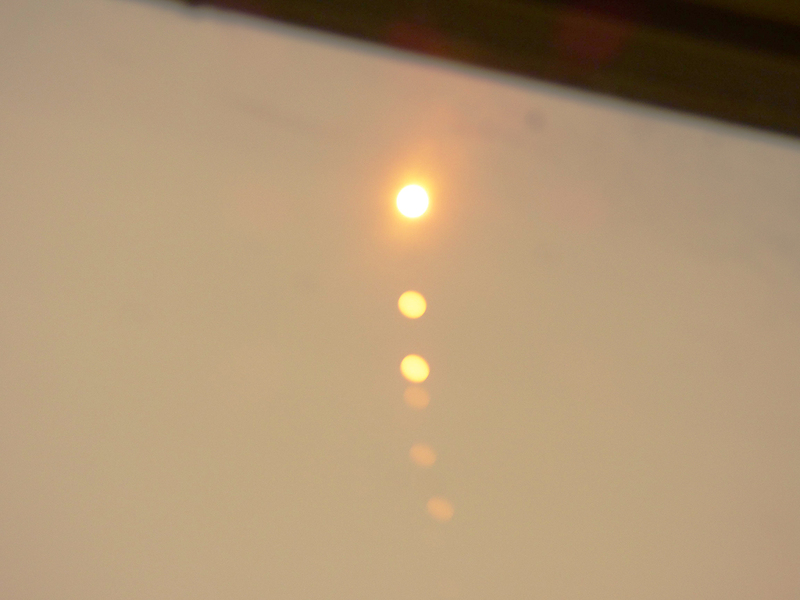 It's not exactly bright, but it is much lighter than what seeps in through the tinted glass. We're happy that two large windows that face east are not so weirdly tinted, so I go into those rooms to give my eyes the light they seek. We are looking forward to making this change as soon as possible. I can hardly wait to see what it's going to look like. 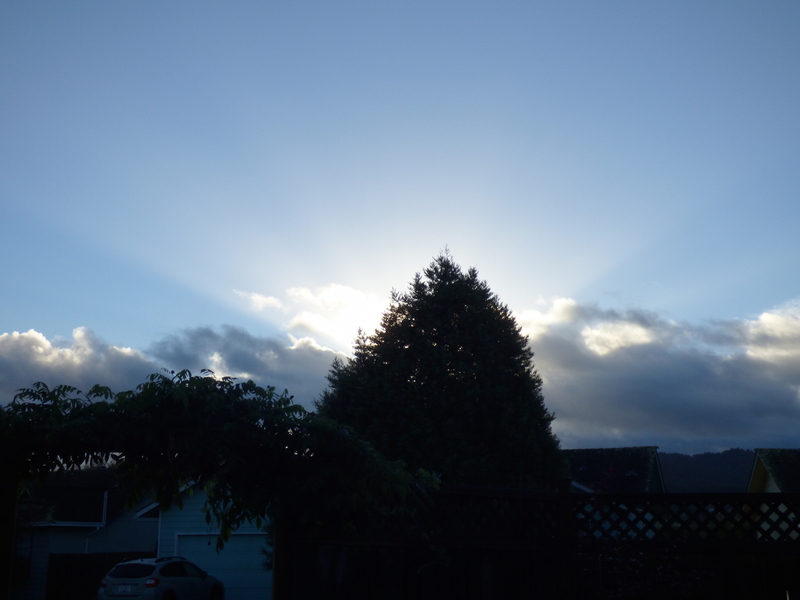 We may not even need skylights if the change is as grand as we think it could be. We'll keep you posted. On a sadder note, Roger and I want to bid a farewell to our old friend Roland. We wrote about him last May. 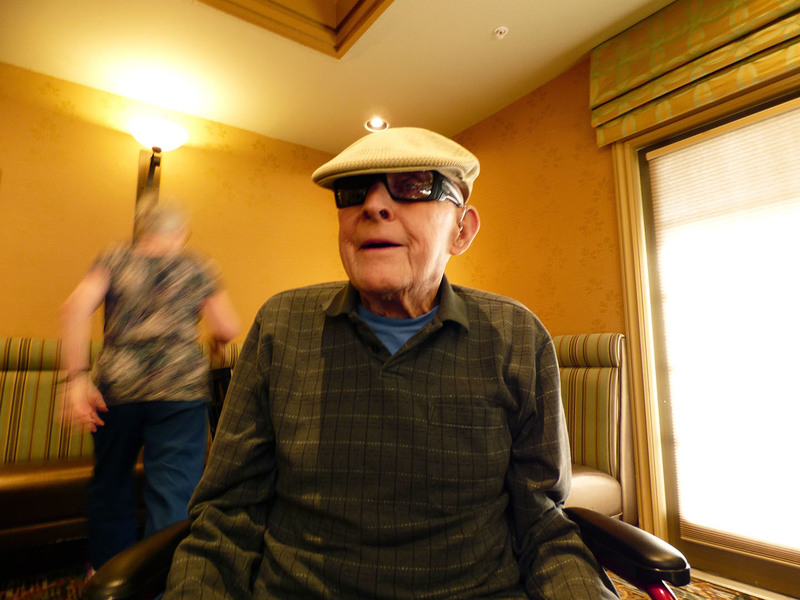 He was 94 years old and still very much in love with the far north coast of the Pacific. We loved talking with him when we visited with my mom in southern California. 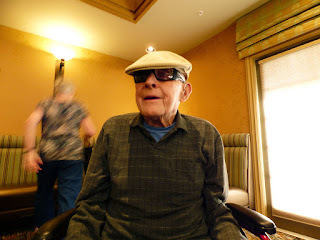 He lived in the assisted living facility there. Roland breathed his last breath Sunday morning, August 23rd. I know he knows we will say a farewell for him to the mountains and ocean that he so loved. We're in the final phases of packing up and moving to our new house. The movers are coming on Friday. One of our kind neighbors let us use her pickup truck to take several small loads over these past few days. It's all happening pretty smoothly, except for you know who, our internet and telephone service provider who can't seem to get our new service order at the new house worked out. We have been given several different order numbers with several different turn on dates: 8/24 (cancelled by them); 8/26 (cancelled by them); 8/27 (cancelled by us). We finally decided to go with their competition here and have telephone and internet service with a cable tv service provider. We had enough with the insanity and incompetence. How much can we endure while we're trying to move? We did get them to restore our service to the rental for this final week we are here. That was done Monday morning. A technician arrived at noon to do a hookup, which we did not need. He said he had called ahead. Oh really? Where did he call, we wondered. He told us the number and we had a good laugh. He called our old number in Grass Valley that we gave up more than 14 months ago. This is what we've been putting up with. But no more. We stopped. We said, ENOUGH. Whew. 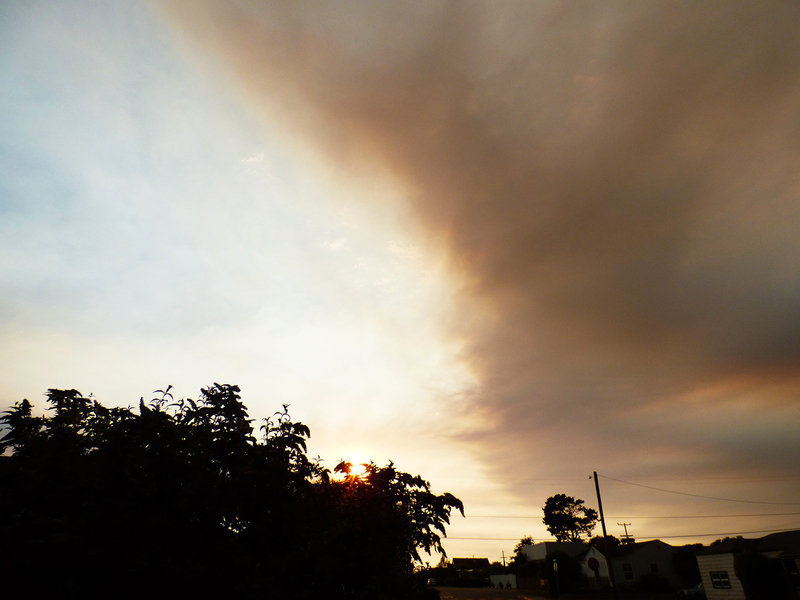 The skies have been smoky again. 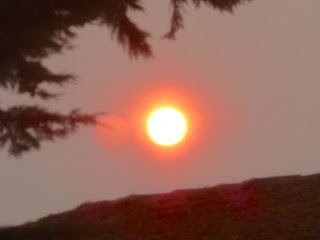 I thought I should look through our windows of lunacy to see what tricks it could do with the crazy orange sun. It made me laugh out loud. I was so happy about that. Laughing makes everything just a little bit better. Moving is a stressful thing. We should know. We've done it many, many times these past twelve years. It's not the packing as much as it's the communicating with everyone about when to shut off services in one place and turn them on in another. For most utilities, it takes a simple phone call, or an email, or a visit to the city office. But for A*T it takes several phone calls, online chats, and emails, and STILL they get it completely and utterly wrong. C'mon folks, it's just a request to turn off the landline and dsl service at one house and turn it on at another. How difficult can that be? Turns out, it is more than just difficult, it is "bang your head against the wall" impossible. As of this writing, we are not absolutely certain they won't try to turn on our service at the new address on Friday August 14th, while the sellers are still living there. We got an email yesterday that was all cheerful and excited with the subject line: Your U-verse installation date is almost here. No, no, no it's not. We wanted it to be installed on August 21st, the day we are moving in, but since they got it wrong, they can't turn it on until August 24th. Oh okay, just three days without our landline or internet at our new house. Thank you A*T for your incredible attention to detail. But we're still not sure about the 14th, and we haven't received a cheerful confirmation about the 24th either. This after hours and hours on the phone with support staff. Ah, this what stress is all about. But on the very bright side, I did have a lovely correspondence with Les Cowley at Atmospheric Optics. I had sent him the photos of the moon's multiple reflections in the window and asked him if he could explain the optics of it. 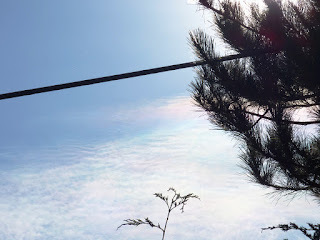 He wrote back and said he would like to use the photos on his site to talk about how people are deceived by these images, thinking they are mirages or things other than reflections in multiple panes of glass. So, some time in the future we'll be getting our explanation. He liked our whimsical window of many lunacies. He was glad that I didn't think they were any more than that. It surprised us to know that people think they could be anything else. Ah well. 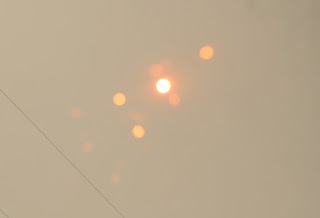 The above photo was taken during a smoky morning here the other day. I tried and tried, but could not capture the color of the sun except in its reflection on our window. 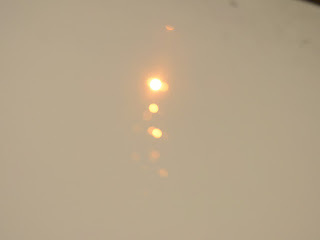 And, just to be absolutely clear, I did not at any time think there were two suns. LOL! We've been going to the marsh lately expecting to see lots and lots of birds, but weirdly there are very few to be found. This has been going on for months. I checked photos from last year, and there were definitely more birds and more species to be seen here. Seriously, there are only a few Great Egrets, a few geese, and some Willets. We're starting to get worried, especially since most of the lakes and ponds are completely empty even when we're seeing fish jumping. Not a diver or dabbling duck to be found anywhere. Not a single grebe either. No pelicans. How can this be? We have no idea, but we are hoping that some crazy new migration pattern is happening and everyone is going to show up at once. We really don't want this to be a look at the future. 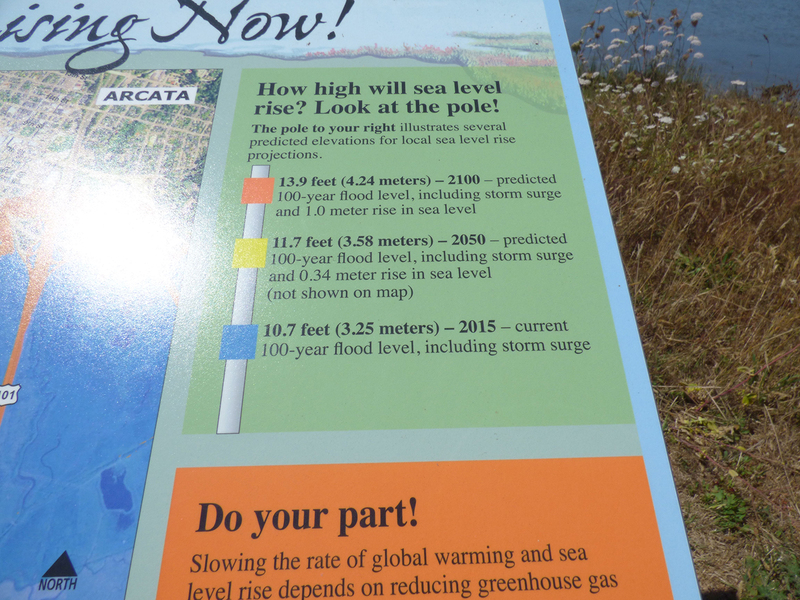 While we were looking around hoping to see some birds, we came across this wonderful post and information sign that has some high water predictions for the future. 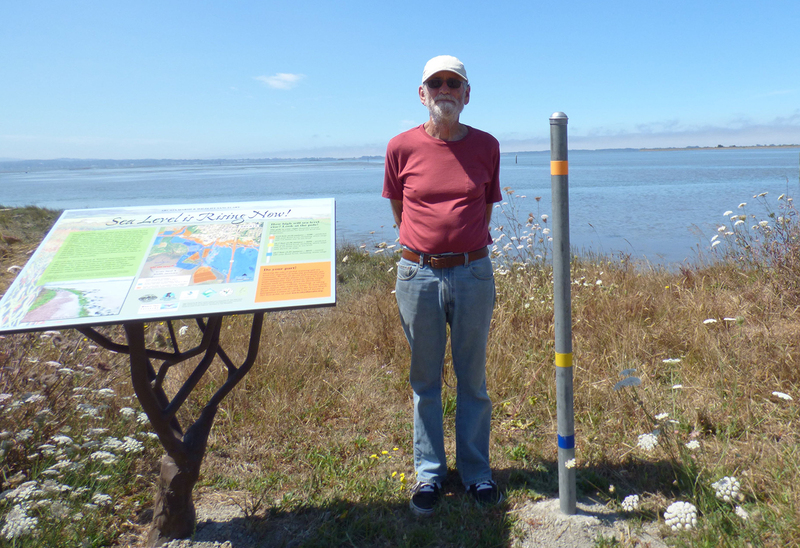 Roger is standing next to the post, and the colors mark where high water may be--given the rising tides and a 100-year flood. A close-up of the key tells the story. The blue marker on the pole represents a 10.7 foot (3.25 meters) high water mark, if we had a 100-year flood this year. That marker is just above Roger's ankle, so I think we'd be okay. 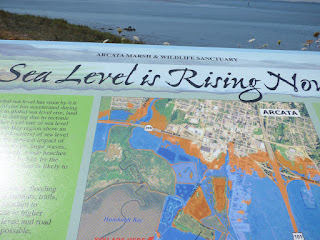 The map doesn't show where in Arcata the water would rise given a 100 year flood 35 years from now, with the tide level already higher by predicted .34 meter rise in sea level. That would be marked in yellow, but the prediction is a 11.7 foot (3.58 meters) high water mark in the year 2050. 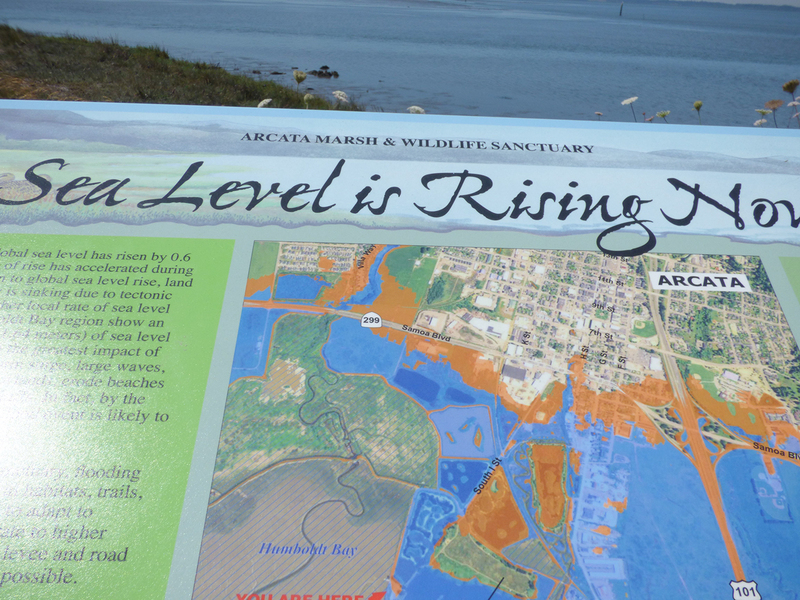 The scariest prediction is the orange 100-year flood level in the year 2100, with a 13.9 foot (4.24 meters) high water mark and a predicted 1.0 meter rise in sea level. Uh-oh. 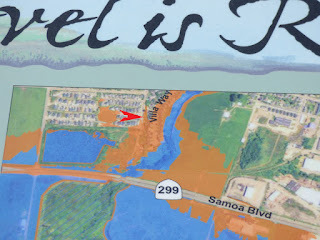 See that red arrow I put on the map. 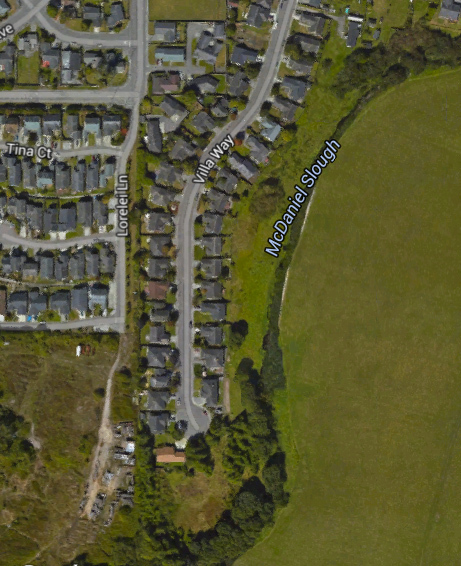 That's where the house we're moving into in a few days is located. Yes, we would be flooded, but only if we lived to be 150 years old. Good thing that is not going to happen. What's interesting about these rising sea levels and storm surge predictions is that they have nothing to do with the other crazy threat on this part of the north coast, the Cascadia Subduction Zone earthquake and subsequent tsunami. We'll be living just outside the tsunami zone, if the tsunami behaves exactly as the science predicts. Hah! The future looks like one wild ride here on earth. Wheee! Roger turns 73 years old today. It seems crazy that he's been on the planet for 73 rotations around the sun, but he has. He received two birthday cards in the mail from old friends, and they both had grand messages. One said, "You are only young once, but you can stay immature indefinitely," (a quote of Ogden Nash). The other had a lovely photo of redwoods with these words, "Birthdays always remind me of the giant redwoods on the West Coast. The way they stand tall and proud, year after year, century after century. Their majestic beauty never fails to take my breath away." Then, inside it says, "Thank you for planting them." Hah! Both cards capture the humor and pleasure of growing old and laughing all the way. That's the way Roger does it, with great joy and huge laughter. We had an early, surprising birthday present on our neighborhood walk on Sunday. We usually head out around 10:00 am for our first walk of the day, but it was foggy and not particularly inviting. So we headed out a bit later after lunch. 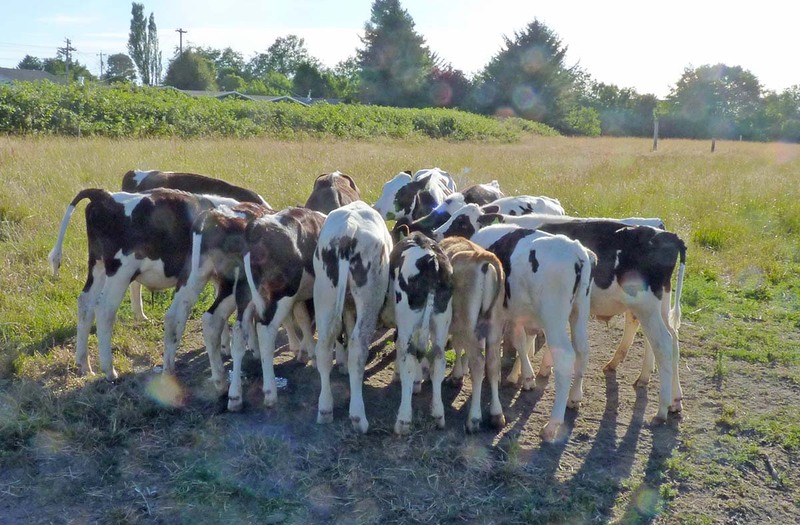 We were pretty close to this old cow pasture, the first one we photographed shortly after we moved here last year. There was a man standing nearby. He had a document and a pen and was busily looking around and measuring stuff. 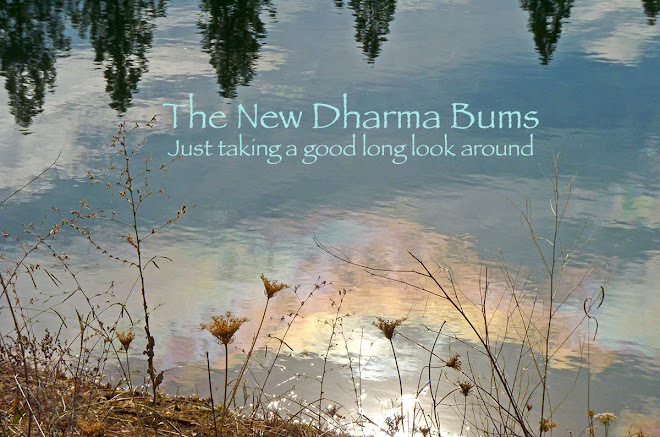 When we walked past him, he looked up and said, "Are you the Dharma Bums?" What? Did he really just ask us if we are the Dharma Bums, or were we imagining such a crazy question? We said, "Did you just ask us if we're The Dharma Bums? What?" He said, "Yes, I've been reading your blog for years. Congratulations on buying that house." Needless to say we were absolutely blown away. We would have never guessed in a million years that someone would actually read our blog and recognize us out in the real world. It was great and funny and a wonderful crazy birthday present for Roger. So, Steve (the guy in the street) noticed I didn't have a camera with me. I told him that the skies were just not inviting the way they were yesterday (Saturday). I said, "Did you see the photo of the smoky crepuscular rays? They were amazing." He said he hadn't seen it. Then I remembered that I had actually posted it on Facebook and not here on the blog. I told Steve that I would post the above photo here for him. So, Steve, here it is. Thank you for recognizing us and saying hello! It has been crazy foggy and smoky here. 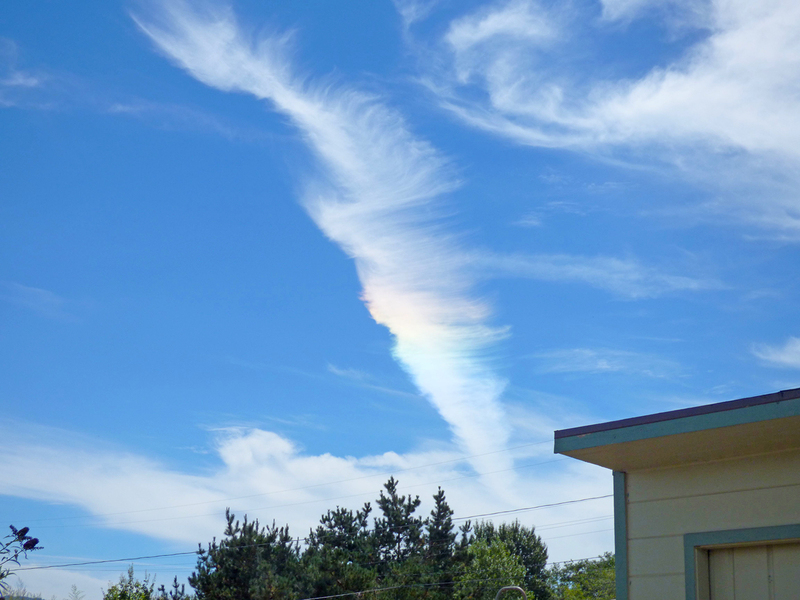 The skies are weirder than ever. The above photo is the sky about an hour before sunset. 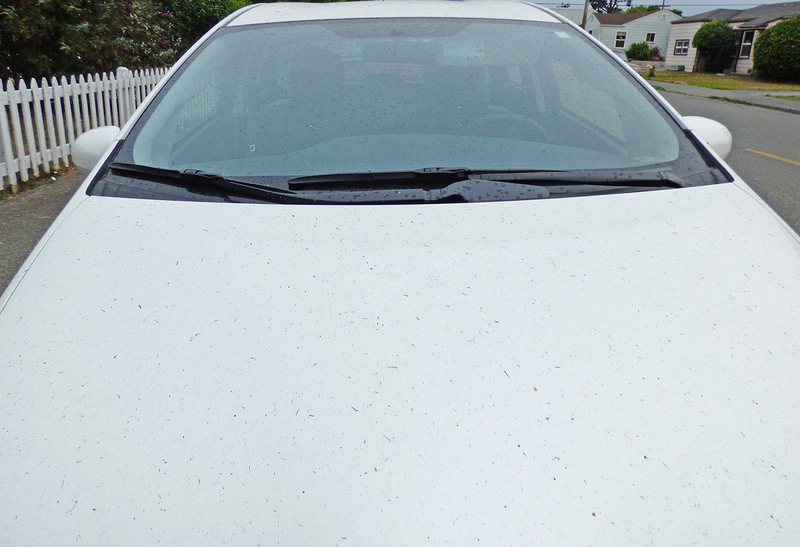 And the photo below is our car sprinkled with ash, and the fires aren't even that close by. It's August in California, and it's Roger's 73rd birthday, and we're laughing at how crazy it all is everywhere all the time.